Description: This book analyses Spirit-reception in Luke-Acts with respect to timing, mechanism, and manifestation. It employs three primary tools: narrative progression/sequential reading, presupposition pools/entity representations (ERs), and focalization. By beginning with Jesus' baptism where Spirit experience is joined to the prayer aspect of the baptismal ceremony and observing Jesus' Luke 11:13 teaching on prayer, one arrives at Acts 2:38-39 with an ER in which Spirit experience is not separated from baptism, but linked with the prayer element of the unitary baptismal ceremony. Acts 2 focalizes dissociative xenolalia and creates a programmatic expectation that all initiates will experience it. Acts 2 does not depict new converts receiving the Spirit and thereby leaves a narrative gap which the reader must fill with information from Jesus' baptism. Acts 8 adds to this information by providing Luke's first depiction of new converts receiving the Spirit and showing the facilitation mechanisms used, prayer and handlaying by gifted individuals. Saul's conversion clarifies that non-apostles can be gifted to facilitate the Spirit. Cornelius' house adds the concept of the Spirit being given during a gifted individual's preaching ministry and shows early church leaders using Pentecost as a standard of comparison. The cumulative nature of presupposition pools/ERs means that the last Spirit-reception scene (Acts 19) must be viewed in the light of all the accumulated Spirit-reception scenes, the total ER. 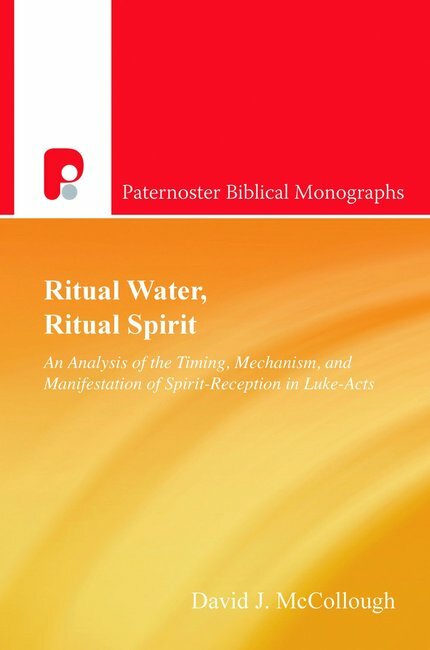 Citation: Mark A. Proctor, review of David J. McCollough, Ritual Water, Ritual Spirit: An Analysis of the Timing, Mechanism, and Manifestation of Spirit-Reception in Luke-Acts, Review of Biblical Literature [http://www.bookreviews.org] (2019).